Disruptive technologies and digital infrastructure have the potential to solve some of the world’s most pressing risks and to transform industries. These include safeguarding the planet’s soil and water, and improving inequality and education. This is the main conclusion of the 2017 Global Opportunity Report, released today by DNV GL, Sustainia and the United Nations Global Compact. The report also demonstrates the commitment of the global business community towards taking action on the UN Sustainable Development Goals (SDGs) and the 2030 agenda. 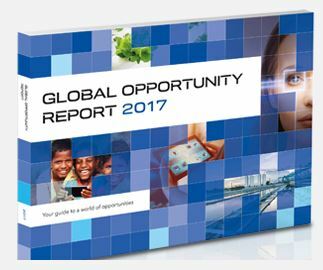 The Global Opportunity Report is an opportunity and solution based response to the World Economic Forum’s Global Risk Report. It enables leaders to navigate new markets, new business opportunities and solutions. For the 2017 edition, 5,500 leaders from within business, government and civil society across five continents provided their insights and identified and ranked 15 sustainability opportunities. The report showcases 120 practical projects and solutions from around the globe that range from micro grids that make cities more resilient to climate change, to bacteria that bring depleted soil back to life, to peer-to-peer trading, and inviting ethical hackers to test cyber security. Providing e-learning to conflict-affected areas is the second-biggest opportunity, giving business the opportunity to contribute to creating more peaceful societies. Rising trust in digital technologies such as blockchain technology and artificial intelligence can help combat many of the global risks such as cybercrime and rising inequality. Hey Buddy!, I found this information for you: "Business Leaders World-Wide Agree that Disruptive Technologies Can Drive Corporate Sustainability Efforts". Here is the website link: https://www.duurzaam-ondernemen.nl/business-leaders-world-wide-agree-disruptive-technologies-can-drive-corporate-sustainability-efforts/. Thank you.